We have been assigned to Rebuilding Day Project #650. 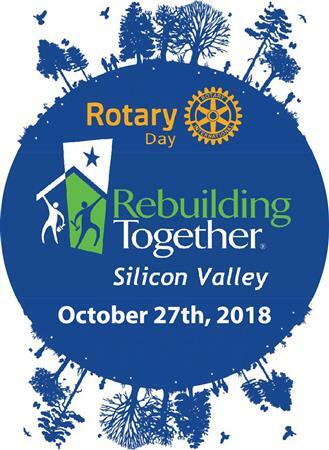 This is a joint effort between Rebuilding Together and the sponsor, Rotary Club of Los Gatos. This year’s project will take us to a home in East San Jose. In just one day there is so much we can to make the life of the 85-year old homeowner safer and happier. Meet the homeowner, Louisa. She owns the home that she and her husband first bought when they were immigrants from Cuba in the 70’s. Louise’s husband died just a few years ago. Louisa and her husband left their professions and all of their belongings in Cuba and came to America to start over with nothing. Louisa had been a teacher in Cuba. She began by learning English, but was not able to go back to school to get a teaching credential. For over 30 years she worked as a Teacher’s Aid. She and her husband saw to the education of the three children and her disabled daughter is now a teacher in a nearby school district. After 58 years of marriage her husband died of lymphoma cancer. Since his death she has had a hard time both emotionally and financially. Louisa is a bright and inspiring woman. She tries to keep active (still uses her treadmill) but due to her arthritis and age she is unable to do all that she used to. Her husband had been very handy at home, but now that he is gone she has neither the funds nor capacity to make some needed improvements for safety and her well being to her home. - painting the house, doing tile work, cleaning up the yard and addressing some safety issues inside her house. Please plan to join us for a day of fun and hard work. Come and benefit from the joy of giving. By the end of just one day we will be able to walk away feeling we have made a difference. Your points of contact for Rebuilding Day will be House Captain, Bill Brasier, and Volunteer Coordinator, Suzanne Boxer-Gassman. They can be identified by their Green t-shirts. The work scope will likely include painting, removing debris, replacing flooring, repairing lighting, and installing post and railing. Parking: Parking is VERY limited. Carpooling is highly recommended. Clothing: Old pants (may get dirt or paint on them) and sensible closed toed shoes. You will receive a t-shirt at the site to wear and take home. For the safety of our homeowners and volunteers, everyone on site must wear the Rebuilding Day t-shirt. Tools that are helpful but not necessary: Hammers, Brooms, Hand tools and saws, Small ladders, Work or Rubber Gloves, etc. You may bring snacks, but we will provide pizza for lunch with fruit, cookies, water and soda. Volunteers under the age of 18 must print and have a parent’s signature on the waiver and bring the waiver to the project. Volunteers must be at least 14 years old.